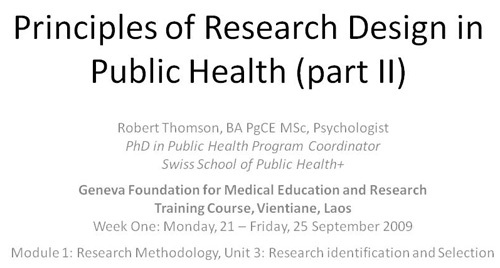 Thomson R. Principles of research design in public health (part II). Research identification and selection. Paper presented at: Training Course in Reproductive Health Research - GFMER - WHO - UNFPA - LAO PDR Programme; 2009 Sep 21; Vientiane, Lao PDR.